Isn’t it strange how your taste in photography seems to change. I shot this image just over three years ago. I recall considering this a poor trip at the time as I didn’t really come back with any “high octane” dramatic shots. What I did get was quite a lot of nice, tranquil scenes which I relegated to a folder on my hard drive and promptly forgot about. Last week I was clearing out some images in order to start work on my new website (coming soon). That’s when I saw this image and wondered why I hadn’t bothered very much with it. Now that I look at it, I really like the scene and the colours. How is the Nikon coming? Very slowly unfortunately. I have only managed two outings with the Nikon due to other commitments. I hope to start posting about it soon though. 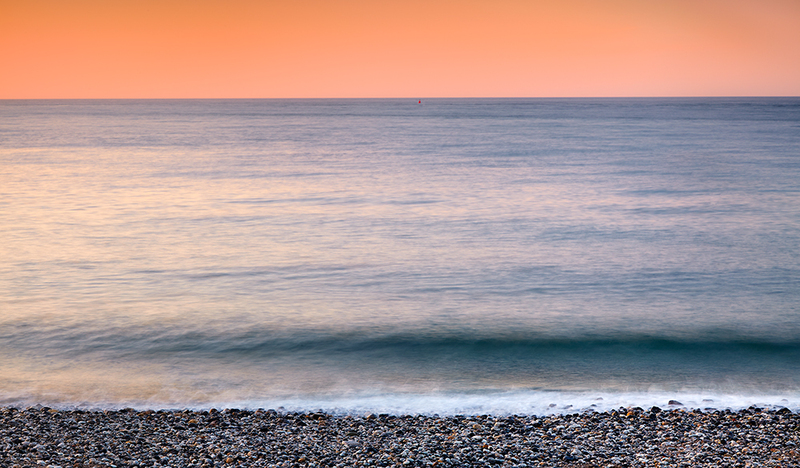 Can you give us a hint of the camera settings used in this tranquil scene? Perhaps you would consider including these on future images? I would find that so educational! Sure I can share the settings. Focal length was 80mm as I wanted to crop in on the area of the sea. Aperture was f/18 as I was trying to control the shutter speed so that I could capture the curl of the wave as hit hit the beach. Shutter speed was 2.6 seconds. To be honest with a shot lik this the shutter speed is the key as you need to get the movement of the water looking right. I just play around with the aperture and ND filters until I achieve the look I wanted. Sorry, nothing more scientific than that. I can certainly share setting in the future but I tend to forget to add them as to me they are not that important other than as a means to create a look for an image e.g. slow shutter or depth of field. If I forget feel free to ask and I will happily share.